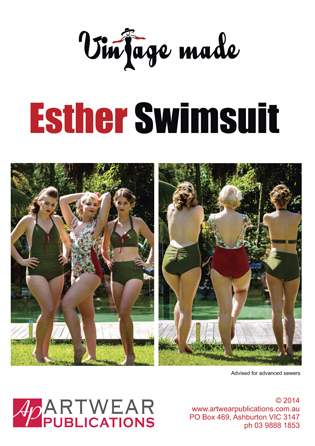 The Esther Swimsuit Pattern was the pull-out pattern in Vintage Made issue 4. Included in this swimsuit pattern are three vintage styles for you to choose from. For the one-piece (option A) you will need Nylon Lycra or Jersey, 60cm (24″) for the two smaller sizes, 70cm (27.5″) for the two mid-sizes, or 80cm (31.5″) for the the last size. For the one-piece (option B) you will need Nylon Lycra or Jersey, 40cm (16″) for the two smaller sizes, 50cm (20″) for the two mid-sizes, or 60cm (24″) for the last size. For the two-piece (option C) you will need 35-40cm (14-15.75″) all sizes, plus a lining (same quantity of fabric), plus contrasting fabric and buttons should you choose these options. Notions: Pins; thread; swimwear elastic; bra cups; swimwear clasps.